While content creation is necessary to any business’s marketing strategy, it does not entirely guarantee the best outcomes. For your content marketing efforts to be successful, you first need to establish your campaign’s goals and track its performance accordingly. But do you know what kinds of results you should be aiming for to begin with? Are you measuring the right things? 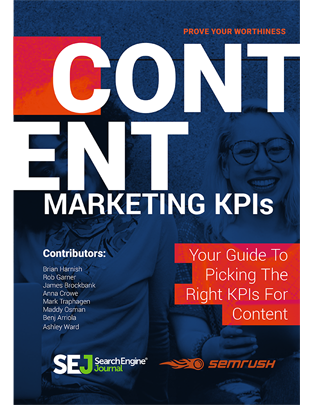 Search Engine Journal’s ebook, Content Marketing KPIs: Your Guide to Picking the Right KPIs for Content, tackles the key performance indicators you should use to measure your content marketing campaign’s performance. Why KPIs are essential in content marketing. The importance of aligning your content marketing goals and metrics. How to pick the right KPIs that truly matter to your business. Authored by the top digital marketing experts, our ebook can help you correctly gauge the effectiveness of your content marketing efforts in relation to your goals, ultimately enabling you to make informed business decisions. EXPERT AUTHORS INCLUDE: Benj Arriola, James Brockbank, Anna Lea Crowe, Rob Garner, Brian Harnish, Maddy Osman, Mark Traphagen, and Ashley Ward. 1.What Are Content KPIs & Why Do They Matter?